On Sunday the Rangers sent Chris Davis down to AAA. After a good rookie season last year Davis’ performance took a step back this year. His power is still there (23% HR/FB), but his already poor strikeout rate has ballooned up to an unacceptable 44.2% K/AB. At the same time his walk rate is still below average. It is very hard any player to succeed with that many strikeouts, and impossible if he doesn’t walk a ton. His wOBA is a paltry 0.288, not acceptable for a 1st baseman (although he was probably due for a bump with his BABIP of .287). The main cause of the all those strikeouts was his historically bad contact rate. 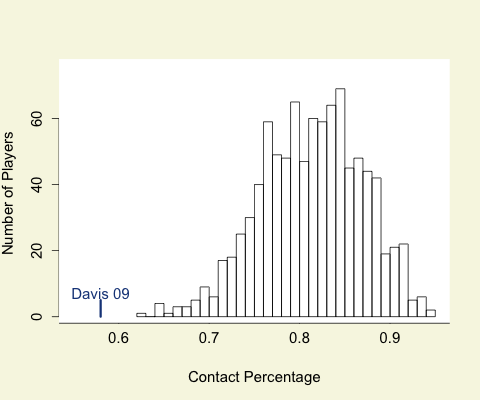 Here is a histogram of the contact rates of all major league regulars from 2008 to 2003, with Davis’ 2009 58% contact rate indicated. The average contact rate is just under 82%, out of over 900 regulars over six years only 17 finished with a contact rate below 70% and none under 60%. Davis’ rate over a full year would have been a major outlier. Major League players just don’t keep full time jobs missing the ball that much, no matter how much power they have. 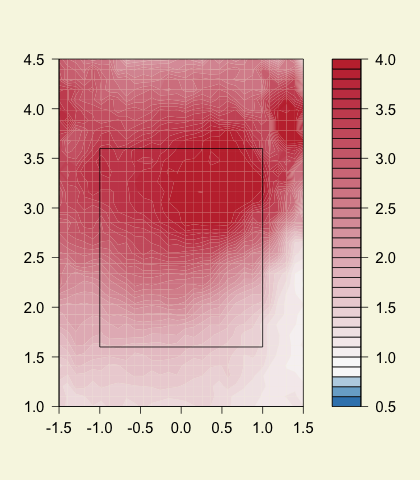 I was additionally interested in where in the strike zone and which pitches Davis was missing. Here I plot how many times higher Davis’ whiff rate (missed pitches divided by swings) is than the average lefty by pitch location. Davis has the biggest problem up and in, whiffing four times the lefty average. Additionally, through most of the zone he whiffs at least twice as much as the average lefty. Here is the whiff rate by pitch type for Davis in 2009 and for all lefties averaged. Davis is getting eaten alive by fastballs (against changeups, curveballs and sliders he is worse than average but probably in line with other power hitters). Hopefully he can work things out in the minors and get his contact rate, and as a result strike out rate, back to his 2008 level. We hoped you liked reading Chris Davis Had a Hard Time Making Contact by Dave Allen!